Made from 100% natural New Zealand wools. Bodies are wood - shorn wools are attached piece by piece - no skins are used to craft these sheep. The heads are crafted from resin from an original hand carved piece. The lambs come in three sizes and two positions (standing and resting). They are designed using all natural colored fleeces; no dyes are used on the colored sheep. 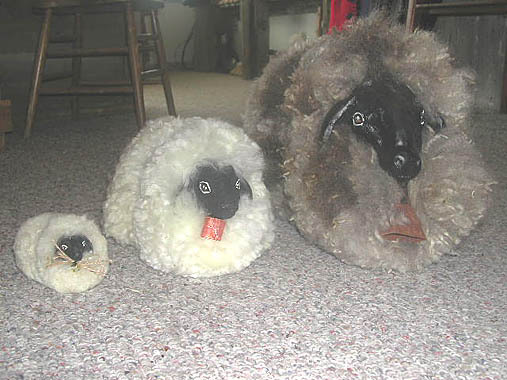 They come in three basic color groups: natural sheep white, gray or dark (blacks, black-browns or deep charcoals).